While lime is not a fertilizer and should not be treated as such, it can serve as an amendment for your soil. The primary purpose of applying lime to your soil is to stabilize its acidity. Lime also serves a few other purposes for your lawn, like regulating the level of magnesium, calcium, copper, zinc, phosphorus, and bacteria in the soil. If you are not sure about applying lime to your lawn, get assistance from a licensed lawn care professional who can help you out and ensure you do everything correctly. Follow these steps if you want to treat your lawn yourself. First and foremost, you will want to test your soil’s pH level to determine if you even need to apply the lime at all. A pH level of 6.0 to 7.0 is usually ideal, but if your soil is too acidic, meaning it is below 6.0, you can use a lime application to cure it. There are self-testing kits sold at most garden centers, or you can bring a sample of your soil to a soil testing laboratory for the most complete results you can find. Calcitic lime is usually the best for your lawn, but lime comes in several types. If you live in a non-agricultural area, the calcitic lime can be tough to find, so other types may be your only option. In a general sense, 100 pounds of lime spread over 1,000 square feet will raise the pH level of your soil by one point. The best times for spreading lime on your soil are fall, winter, and early spring, as these are the times you will usually prepare the soil for planting. Try not to apply the lime if your grass is wilting or covered with frost, as it will be far less effective. Apply the lime to your lawn using a drop spreader, and make sure you follow all guidelines to ensure the lime covers every area of soil it needs to. Spread the lime in horizontal rows until the entire area is covered. Make sure it is evenly distributed for best results. 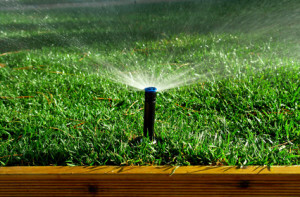 Once the lime is applied, lightly water the lawn to help the soil absorb the lime and keep it from washing away. Repeat the process once every month if needed, but try to find a good, healthy pH level for the best quality grass. Test the soil again in three to five years to make sure the pH level is where it should be. If not, go through the process again to get your soil back where it needs to be.